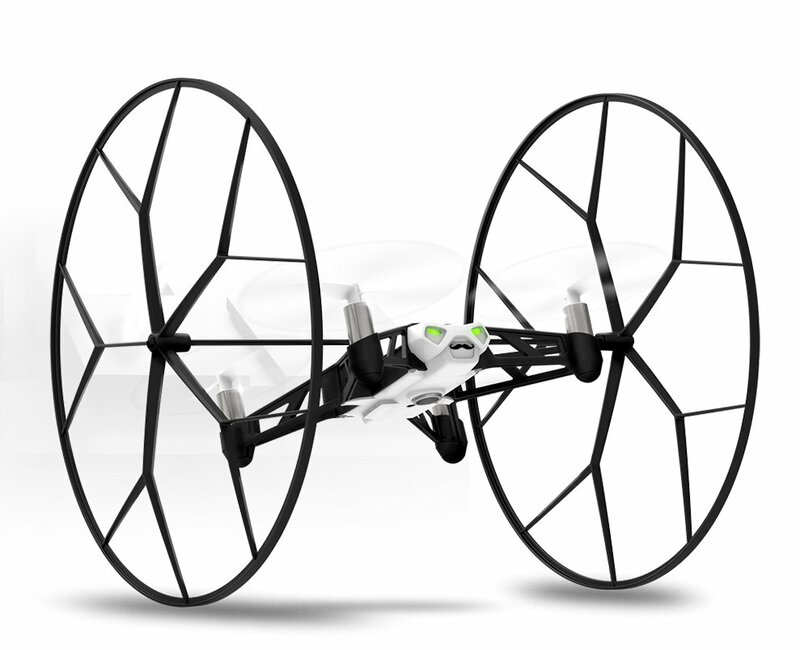 Whether for a birthday, the holidays, or just for fun, a drone is the ultimate gift for kids. Controlling a drone and making it take off and perform stunts is absolutely exhilarating. 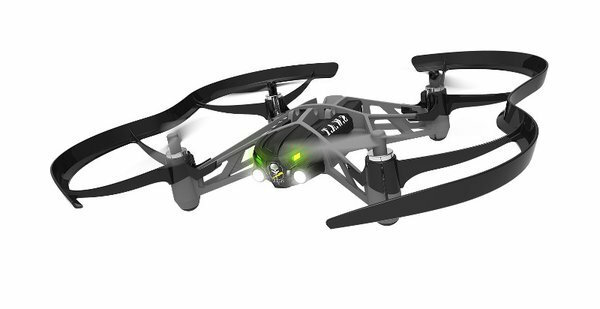 With Tynker, kids can blend this fun with learning by programming their drones. This allows in them to do much more advanced things with coding, and in the process learn the fundamentals of computer science. When kids can program the drone themselves, they’re not just reading instructions from a manual–they’re inventing their own play, and learning valuable debugging skills in the process. Drones are great for allowing children to play, explore, experiment, and learn. 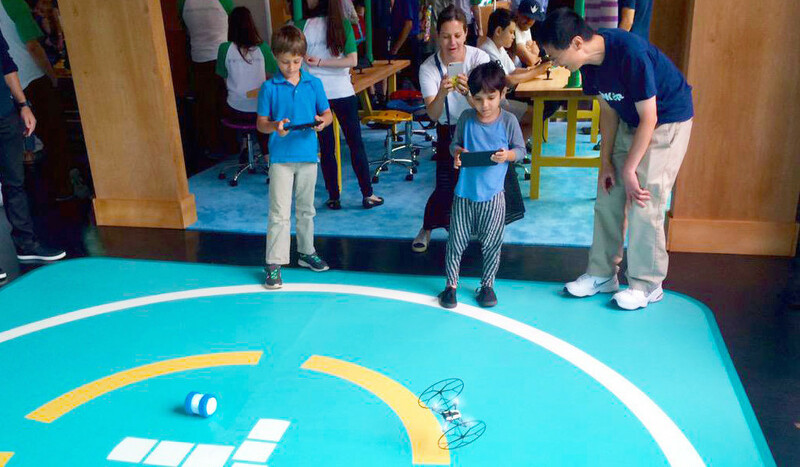 Drones inspire them to learn the fundamentals of code because they allow kids to visualize their code and use programming to solve real-world challenges. With Tynker, kids can use an iPad or Android tablet to control their drone. They download the Tynker app and can quickly start learning the basics of code by completing puzzles that use drag-and-drop blocks to teach coding concepts without the frustrations of syntax. Learning to code with a drone requires an iPad or Android tablet with the free Tynker app, as well as a supported drone. In the Tynker app, you’ll find a puzzle set called Crash Course. In the 18 Crash Course puzzles, kids navigate a virtual drone through virtual obstacles, preparing them to program the real thing. These fun puzzles teach kids the fundamentals of programming, including sequencing, loops, conditionals, and more. They also learn the specific commands they’ll need to control their drone. Kids can start off with basic tasks, like creating a program that makes the drone take off, fly forward, and then land. Once they’re comfortable with simple tasks, they can program the drone to trace patterns or navigate obstacle courses. The Tynker app provides a few basic templates, but kids can do much more. 1. 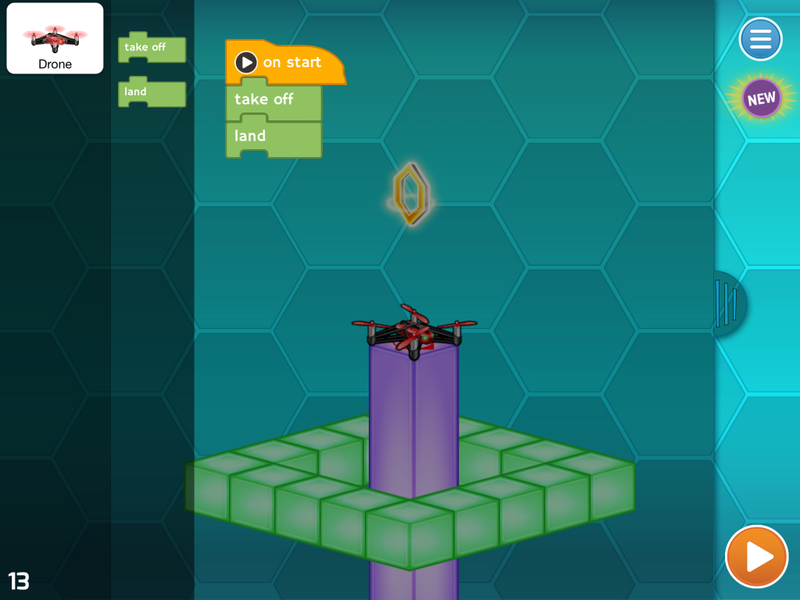 Program the drone to take off and land when a button is pressed. 2. 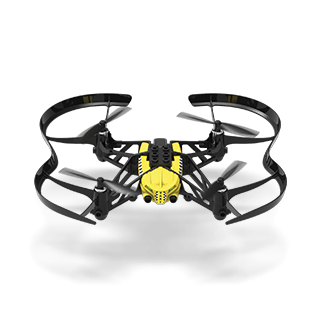 Program the drone to take off, flip, and land. 3. 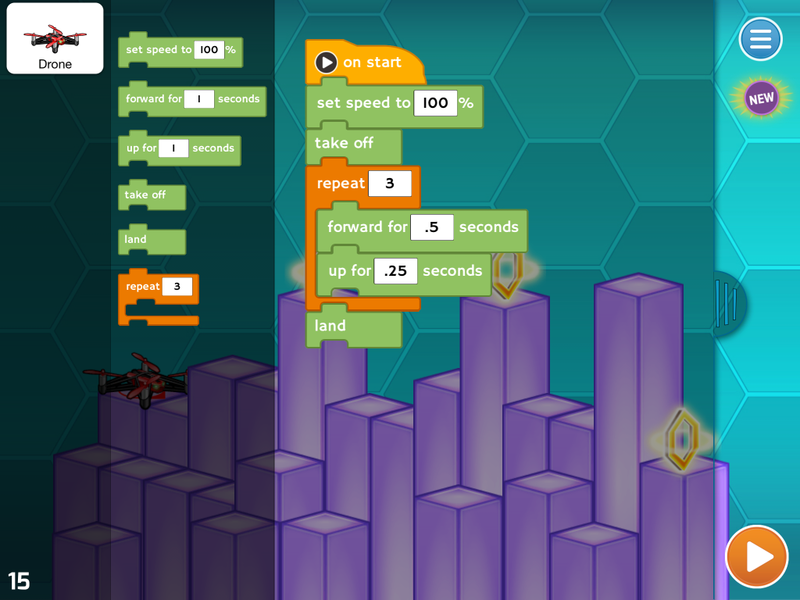 Program an advanced flight path, like flying in a square or circle. 4. 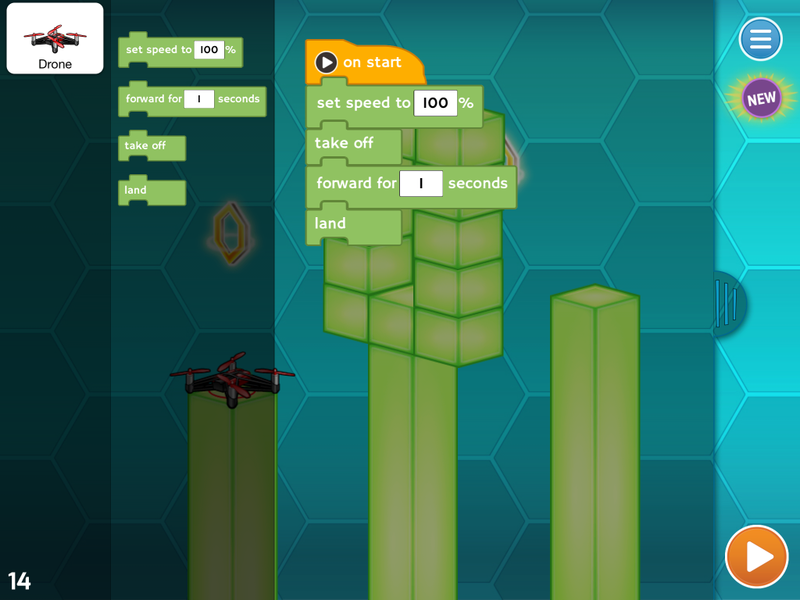 Make an interactive “Flappy Drone” game. The Tynker app also supports Sphero and Ollie, as well as Phillips Hue Lights. If your child wants to do more with programming, you can subscribe to our home courses. With a subscription, your child can access all nine of our programming courses, which provide hours of structured, scaffolded learning in the game-like Tynker learning environment as well as three Minecraft modding courses. The philosophy of learning through play and experimentation is central to Tynker programming courses. Each lesson is structured around learning the skills necessary to build a game that kids actually want to play. Once they’ve mastered the relevant coding skills, they program their own versions of popular games like platformers, RPGs, and more. Child safety is crucial with drones, especially if they are new to the technology. Even small drones can do damage if used indoors and must be used with caution. Make sure to use the drone in a large open space, preferably outdoors, where there is nothing fragile or easy to knock over. Remind kids to keep a few feet between themselves and the drone whenever it is on. The drone’s propellers, although small, can cause injuries. If your child is younger than 14, we recommend that an adult always be present and engaged when using the drone.